"Inside Out," a comedy-adventure set inside the mind of an 11-year old girl, is the kind of classic that lingers in the mind after you've seen it, sparking personal associations. And if it's as successful as I suspect it will be, it could shake American studio animation out of the doldrums it's been mired in for years. It avoids a lot of the cliched visuals and storytelling beats that make even the best Pixar movies, and a lot of movies by Pixar's competitors, feel too familiar. The best parts of it feel truly new, even as they channel previous animated classics (including the works of Hayao Miyazaki) and explore situations and feelings that everyone has experienced to some degree. The bulk of the film is set inside the brain of young Riley (Kaitlyn Dias), who's depressed about her mom and dad's decision to move them from Minnesota to San Francisco, separating her from her friends. Riley's emotions are determined by the interplay of five overtly "cartoonish" characters: Joy (Amy Poehler), a slender sprite-type who looks a little bit like Tinkerbell without the wings; Sadness (Phyllis Smith), who's soft and blue and recessive; Fear (Bill Hader), a scrawny, purple, bug-eyed character with question-mark posture; Disgust (Mindy Kaling), who's a rich green, and has a bit of a "Mean Girls" vibe; and Anger (Lewis Black), a flat-topped fireplug with devilish red skin and a middle-manager's nondescript slacks, fat tie and short-sleeved shirt. There's a master control room with a board that the five major emotions jostle against each other to control. Sometimes Joy is the dominant emotion, sometimes Fear, sometimes Sadness, etc., but never to the exclusion of the others. The controller hears what the other emotions are saying, and can't help but be affected by it. The heroine's memories are represented by softball-sized spheres that are color-coded by dominant emotion (joy, sadness, fear and so forth), shipped from one mental location to another through a sort of vacuum tube-type system, then classified and stored as short-term memories or long-term memories, or tossed into an "abyss" that serves the same function here as the trash bin on a computer. ("Phone numbers?" grouses a worker in Riley's memory bank. "We don't need these. They're in her phone!") Riley's mental terrain has the jumbled, brightly colored, vacu-formed design of mass market toys or board games, with touches that suggest illustrated books, fantasy films (including Pixar's) and theme parks aimed at vacationing families (there are "islands" floating in mental space, dedicated to subjects that Riley thinks about a lot, like hockey). There's an imaginary boyfriend, a nonthreatening-teen-pop-idol type who proclaims, "I would die for Riley. I live in Canada." A "Train of Thought" that carries us through Riley's subconscious evokes one of those miniature trains you ride at zoos; it chugs through the air on rails that materialize in front of the train and disintegrate behind it. The story kicks into gear when Riley attends her new school on the first day of fifth grade and flashes back to a memory that's color-coded as "joyful," but ends up being reclassified as "sad" when Sadness touches it and causes Riley to cry in front of her classmates. Sadness has done this once before; she and Joy are the two dominant emotions in the film. This makes sense when you think about how nostalgia—which is what Riley is mostly feeling as she remembers her Minnesota past—combines these two feelings. A struggle between Joy and Sadness causes "core memories" to be knocked from their containers and accidentally vacuumed up, along with the two emotions, and spat into the wider world of Riley's emotional interior. The rest of the film is a race to prevent these core memories from being, basically, deleted. Meanwhile, back at headquarters, Fear, Anger and Disgust are running the show. It's worth pointing out here that all these characters and locations, as well as the supporting players that we meet inside Riley's brain, are figurative. They are visual representations of ineffable sensations, a bit like the characters and symbols on Tarot cards. 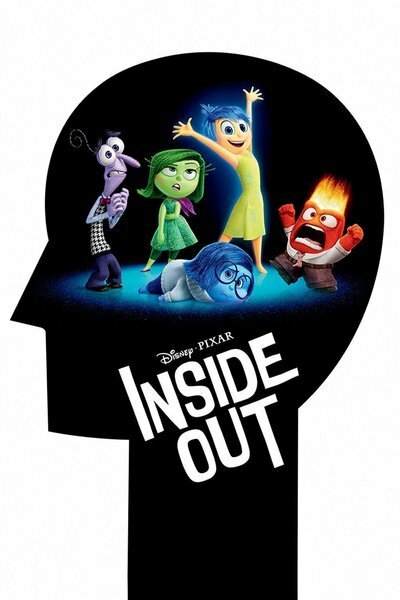 And this is where "Inside Out" differs strikingly from other Pixar features. it is not, strictly speaking, fantasy or science fiction, categories that describe the rest of the company's output. It's more like an extended dream that interprets itself as it goes along, and it's rooted in reality. The world beyond Riley's mind looks pretty much like ours, though of course it's represented by stylized, computer-rendered drawings. Nothing happens there that could not happen in our world. Most of the action is of a type that a studio executive would call "low stakes": Riley struggles through her first day at a new school, gets frustrated by her mom and dad pushing her to buck up, storms to her room and pouts, etc. The script draws clear connections between what happens to Riley in San Francisco (and what happened to her when she was little) and the figurative or metaphorical representations of those same experiences that we see inside her mind, a parallel universe of fond memories, repressed pain, and slippery associations. The most endearing and heartrending moments revolve around Bing-Bong (Richard Kind), the imaginary friend that Riley hasn't thought about in years. He's a creature of pure benevolence who only wants Riley to have fun and be happy. His body is made of cotton candy, he has a red wagon that can fly and that leaves a rainbow trail, and his serene acceptance of his obsolescence gives him a heroic dimension. He is a Ronin of positivity who still pledges allegiance to the Samurai that released him years ago. Written by Meg LeFauve and Josh Cooley from a story by Ronnie del Carmen and Pete Docter, and directed by Docter ("Monsters, Inc." and "Up"), "Inside Out" has the intricate interplay of image and sound that you've come to expect from Pixar. It also boasts the company's characteristic, three-leveled humor aimed at, respectively, very young children, older kids and adults, and pop culture buffs who are always on the lookout for a clever homage (a separate class of obsessive). There's nothing quite like hearing a theater packed with people laughing at the same gag for different reasons. A scene where Bing-Bong, Joy and Sadness race to catch the Train of Thought is exciting for all, thanks to the elegant way it's staged, and funny mainly because of the way Poehler, Smith and Kind say the lines. But adults will also appreciate the no-fuss way that it riffs on poetic and psychological concepts, and aficionados of the histories of animation and fine art will dig how the filmmakers tip their hats to other artistic schools. The characters get to Imagination Land by taking a shortcut through Abstract Thought, which turns them into barely-representational characters with smashed-up Cubist features, then mutates them into flat figurines that suggest characters in a 1960s short film by UPA, or an animation company based in Eastern Europe. There are very sly throwaway gags as well, like a character's comment that facts and opinions look "so similar," and a pair of posters glimpsed in a studio where dreams and nightmares are produced: "I'm Falling For a Very Long Time Into a Pit" and "I Can Fly!" It's clear that the filmmakers have studied actual psychology, not the Hollywood movie version. The script initially seems as if it's favoring Joy's interpretation of what things mean, and what the other emotions ought to "do" for Riley. But soon we realize that Sadness has just as much of value to contribute, that Anger, Fear and Disgust are useful as well, and that none of them should be prized to the exclusion of the rest. The movie also shows how things can be remembered with joy, sadness, anger, fear or disgust, depending on where we are in the narrative of our lives and what part of a memory we fixate on. There's a great moment late in the story where we "swipe" through one of Riley's most cherished memories and see that it's not just sad or happy: it's actually very sad, then less sad, then finally happy. We might be reminded of Orson Welles' great observation, "If you want a happy ending, that depends, of course, on where you stop your story." The film is even more remarkable for how it presents depression: so subtly but unmistakably that it never has to label it as depression. Riley is obviously depressed, and has good reason to be. The abyss where her core memories have been dumped is also a representation of depression. True to life, Riley stays in her personal abyss until she's ready to climb out of it. There's no magic cure that will make the pain go away. She just has to be patient, and feel loved. A wise friend told me years ago that we have no control over our emotions, only over what we choose to do about them, and that even if we know this, it can still be hard to make good decisions, because our feelings are so powerful, and there are so many of them fighting to be heard. "Inside Out" gets this. It avoids the sorts of maddening, self-serving, binary statements that kids always hate hearing their parents spout: Things aren't so bad. You can decide to be happy. Look on the bright side. Even as we root for Riley to find a way out of her despair, we're never encouraged to think that she's just being childish, or that she wouldn't be taking everything so seriously if she were older. We feel for her, and with her. She contains multitudes.